If you’ve been paying attention, many impressive openings are happening around the Xintiandi area, including excellent new venues such as super hip bar, The Odd Couple and world-famous American burger joint, Shake Shack. Amidst this windfall, one of the neighborhood’s newest residents is an Italian restaurant called Meanwhile in Xintiandi by the PizzaExpress group. We are the first to admit that we have found the quality at the ubiquitous chain lacking on recent visits, and had no idea what to expect from this new venture, with its promise of an “all-day dining experience that can nourish comfort or awaken the soul – all delivered with a refined simplicity and relaxed attitude.” That’s a big claim, but the group has made savvy hires by enlisting Shanghai bar veteran, Aaron Feder to head up the outstanding drinks program and bringing over a talented chef, Jose Graziosi, from London. Meanwhile’s menu is ‘inspired by’ Italian rather than a straight up delivery of the classics. The drinks complement the food with choices meant for quaffing before, during and after your meal. We recommend starting your meal with the smoked chocolate ‘Boulevardia’ (RMB108). The masterful mix of Talisker Storm, Cocchi Torino, Rinomato, Mole bitters and a spritz of Laphroaig will whet your appetite. We love cheese with rice, so Arancini al Funghi Porcini (RMB68) is a must. Thankfully, the creamy interior spilling forth from golden rice-filled fritters do not disappoint. Another fantastic starter is the Peperoni Ripieni di Salsiccia (RMB68), which sees a charcoal-kissed romanesco pepper filled with a flavorful portion of Italian sausage, herbs and truffle oil. It has the familiar flavors of Italian-American sausage and peppers, in a much more composed dish. The Pollastrello Diavola (RMB98) is a sous vide chicken finished on their Bertha charcoal oven, providing both crispy skin and a juicy center. The addition of smoked spices takes this dish to another level. The pasta dishes aren’t bad either. Conchiglioni (RMB108) or shells stuffed with broccoli, wild mushrooms, pecorino and sausage are served with a zesty arrabbiata sauce. That one is delicious, but the portion size is small for the price. 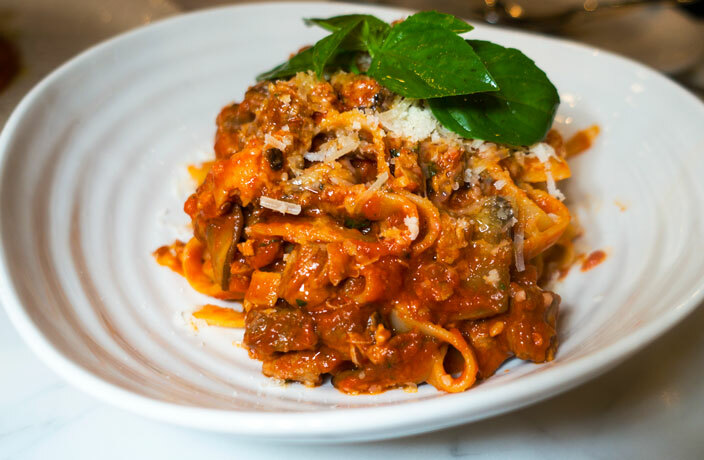 No complaints for the Tagliatelle Tre Carni (RMB148) though, we were blown away by the rich ragu made with a luscious mix of veal, beef and pork. There are better Italian restaurants in Shanghai, but not that many with such a great mix of food and drinks. And overall, we find their prices pretty reasonable for their location. Only open for a little over a month, they are still working out minor kinks in service. In the meantime, we are still happy to pop in for a cheerful meal and some cocktails. Have you been to Meanwhile in Xintiandi? Post your review here for a chance to win a Saucepan voucher. A humble British chippy in the front of friendly Jing'an dive bar BnC.